Airbus is using a small-sized, 3D printed pilotless aircraft as a testbed for futuristic aircraft technologies ranging from 3D printed structural parts to advanced aerodynamics and artificial intelligence. 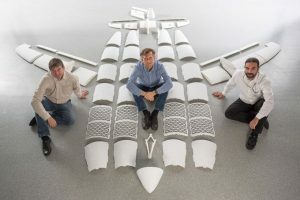 Detlev Konigorski, Gunnar Haase and Andreas Poppe (from left to right) with individual printed parts of the four-metre-long THOR project aircraft. Powered by two 1.5 kW electrically-driven propellers, this mini aircraft– known as THOR (Testing High-tech Objectives in Reality) – weighs approximately 21 kg and can fit in a four-metre-by-four-metre square. About 90% of its structural components were 3D printed from plastic polyamide powder. “This mini aircraft does not represent an actual airliner design Airbus is considering, rather it is a platform to enable low-risk and fast-track development of different technologies in real flying conditions,” explained Detlev Konigorski of Airbus’ Emerging Technologies & Concepts activity in Germany, who oversees the THOR project. According to Airbus, a major advantage for THOR is the short lead time of 3D printing, which significantly reduced development time for producing the technology demonstrator compared to traditional manufacturing methods. “Using an existing design concept, it took approximately seven weeks to print the THOR aircraft’s 60 structural segments, followed by approximately one week for assembly and three days to fine tune the electrical systems before it was flight-ready,” the company said in a press release. THOR’s maiden flight occurred in November 2015, and the mini aircraft is resuming testing following its display at the recent Airbus Innovation Days exhibition and the ILA Berlin Air Show. “The first flight was simply about flying,” Mr Konigorski said. Airbus is currently assembling follow-on THOR versions at the new Center of Applied Aeronautical Research in Hamburg, Germany, in which Airbus is a major partner and shareholder. The company said that these aircraft will feature a modular design allowing for greater flexibility in airframe and structural testing. “For example, the second THOR version will accommodate interchangeable wings, including concepts for a hexagonal wing with support structure derived from a honeycomb design; a metallic aluminium wing; and a flexible wing made from carbon-fibre reinforced plastics,” reads the press release. According to Mr Konigorski, another important aspect of the THOR project is the team’s “willing-to-fail approach,” which helps Airbus push the envelope of experimentation. He said the goal was to implement high-risk ideas on flying vehicles as soon as possible. “If a THOR aircraft takes off, and after 30 feet makes a nose dive back the ground, our attitude is: ‘good, let’s sweep it off the runway and come up with a better idea,” Mr Konigorski said.